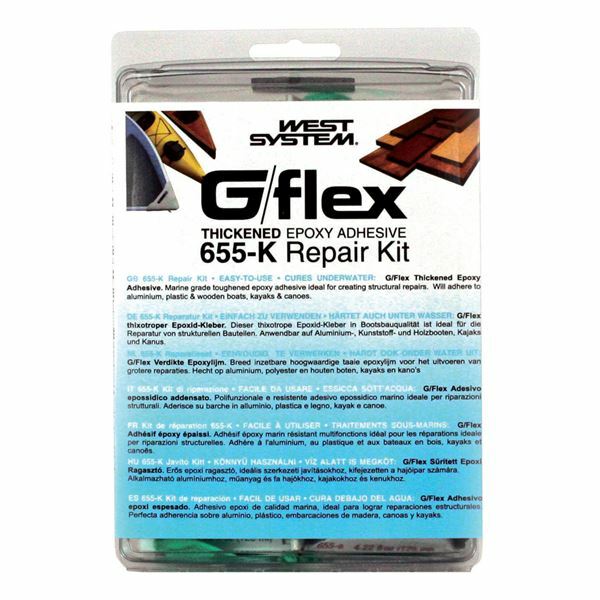 WEST SYSTEM G Flex 655 is a thickened, easy-to-use epoxy that permanently bonds fibreglass, ceramics, metals, plastics, damp and difficult-to-bond woods. WEST SYSTEM G Flex 655 is toughened to make structural bonds that absorb the stresses of expansion, contraction, shock and vibration. Glue resinous woods, exotic woods and a wide range of dissimilar materials. Repair aluminium, plastic and wooden boats, kayaks and canoes. This kit contains 4.5 fl. oz. G/flex 655 resin, 4.5 fl. oz. 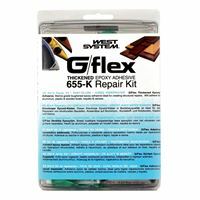 G/flex 655 hardener (9 fl. oz. of mixed epoxy), 2 reusable mixing stick/applicators, 4 alcohol cleaning pads, 1 pair disposable neoprene gloves, 10 mixing palettes and complete handling and repair instructions.